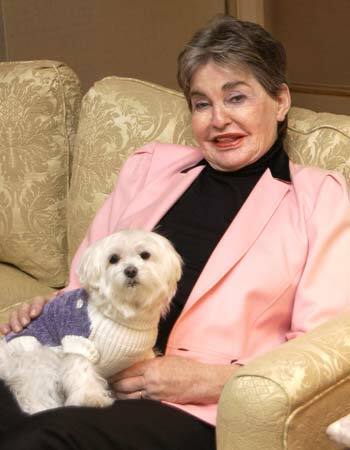 When Leona Helmsley, the NYC hotel operator and real estate investor known as "The Queen of Mean," died she was mostly talked about as a billionaire who donated a large portion of her fortune to her dog. However, her Charitable Trust (The Leona M. and Harry B. Helmsley Charitable Trust) has recently announced grants totaling more than $10.1 million to help fund three major projects in Israel, including one that has been very close to my heart since a trip to Israel in 2002. In addition to multi-million dollar grants to the Tel Aviv Sourasky Medical Center and the Weizmann Institute of Science, Helmsley's trust also gave $2 million for the benefit of the Zahal Disabled Veterans Organization, which will help build a state-of-the-art center in Beersheva for rehabilitation and support services for disabled veterans and victims of terrorism. This grant also will help construct and equip the center in order to provide a supportive environment for rehabilitation and integration of disabled veterans and victims of terrorism in southern Israel. The center, whose total cost is $23.3 million, is scheduled to open in the fall of 2010. My wife and I were vacationing at the Dead Sea in December 2002 when we met some new friends and became acquainted with Nechei Tzahal (Zahal Disabled Veterans Organization). We met Yisrael Abayov, a successful architect from Tel Aviv, who shared his story of fighting for Israel in 1978 when he was hit with a bullet. It was a direct shot to his left temple leaving him disabled for the rest of his life. He was lucky to be alive. In addition to Yisrael, there were hundreds of men at our hotel who became severely disabled while fighting for Israel. Some, like Yisrael, can barely walk anymore, even with the aid of a cane or a walker. Others are amputees, missing an arm or a leg, and bound to a wheelchair for the rest of their lives. Others still, were not injured while on active duty, but rather suffered life-long disabilities from a terrorist explosion while waiting at a bus stop just trying to get back to the base after a weekend off. They were at the Dead Sea to find some temporary relief from their disabling pain through the therapeutic powers of the Dead Sea. They come each year for two or three weeks, and most of the hotels are very accommodating to their needs, displaying a level of handicapped accessibility that is unmatched anywhere in the world. The Israeli Government pays for their much-deserved vacation, but if it is not taken by the end of the year, the opportunity is lost. Thus, many of them make their vacation to the Dead Sea at the end of every December; making the Dead Sea, in essence, the unofficial convention and reunion of Israel’s disabled veterans. I spent an hour talking about politics and religion with a couple of veterans who were on the beach with their wives. One of these men, whose foot was blown off by a land mine in the Sinai Desert in 1956, explained that he and his wife had been coming to the Dead Sea for three decades and it is the only time he feels any relief from his injuries. When I remarked to the other veteran how nice it is that the Israeli government provides them with a complimentary vacation for a couple of weeks, he looked me in the eyes, put his hand on my shoulder, and said, "Trust me, we paid for it." I'm glad that in death, Leona Helmsley (born Lena Mindy Rosenthal) has been able to improve on her reputation. The woman who served a prison term, famously said that only the little people should pay taxes, and left the bulk of her $4 billion estate to her Maltese, has posthumously become philanthropic to some very important causes. It's nice to see that in all the craziness of her story that there was some good to come out of her wealth.